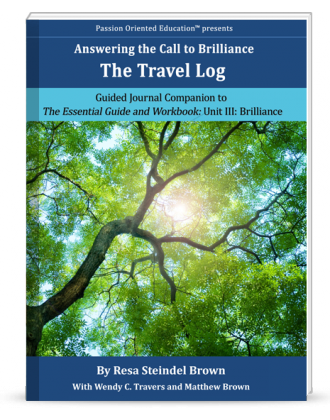 The Travel Log, Unit III Brilliance, is the third of three guided journals directly coordinated and to be used exclusively with Unit III in Answering 'The Call to Brilliance,' The Essential Guide and Workbook. The Travel Log is designed to help you stay organized and on track while preserving your observations and insights for future reference. 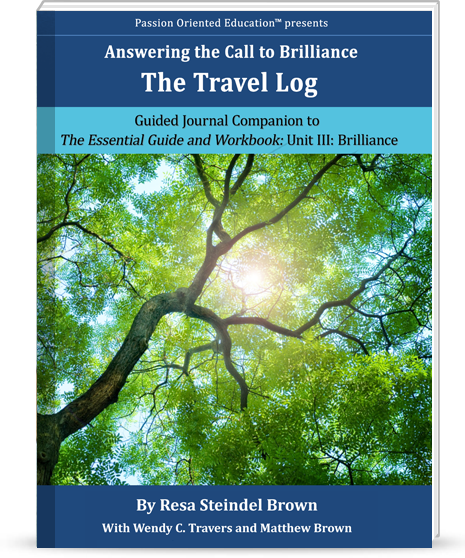 This guided journal corresponds directly and is to be used exclusively with Unit III Brilliance in Answering 'The Call to Brilliance,' The Essential Guide and Workbook. Now that you have found and nurtured your child’s passions in Unit II, Unit III of The Essential guide and Workbook, also known as The Workbook, will help you introduce your child's work into the world. Based on the information in The Essential Guide and Workbook, also referred to as The Workbook, you will monitor and track your child's progress as your child develops professional competencies. You will learn to read and record the signs that tell if your child is internally and passionately motivated, and ready and mature enough to step out into the community. We will help you identify and chronicle ways to bring your child’s creative skills into tangible form. You will explore creating a product, business or service organization, and document your findings for current and future reference. You will brainstorm and record ways to introduce your child to hobby and networking organizations, mentors and internships. You will help your child build a portfolio of professional quality work and develop relationships with important community liaisons, exploring opportunities to develop real-life skills into the world. All of these activities will culminate in a professional resume and portfolio. At the end of this phase of your journey, we will explore the meaning of and purpose for finding passion and brilliance in relation to life-long success. Our goal in creating this guided journalis to help you chronicle your child's journey to contentment and self-fulfillment. Using The Travel Log is a great way to record your insights, keep your thoughts clear and clean, and remember exactly what you observed so that you can take appropriate action. We are so very pleased to be able to share The Travel Log Unit III, Brilliance, and take this important step with you. We personally find this phase so very rewarding as we watch our children propel themselves into their brilliance and calling. The information you gather and log can be used to create a professional resume and portfolio you can refer to well into the future. As you did in Units I and II, read the information presented in the corresponding section of Unit III in The Workbook. Then, use this guided journal to record your observations and ideas. Return to The Workbook to summarize your findings and use that information to execute the respective workbook activities. The Travel Log makes it easy to move back and forth between The Workbook and your observations. The on-the-go format was designed to help you capture your thoughts, feelings and insights as they happen, so you can better help your child. Again, we recommend you carry your Travel Log around with you as you move through your week. Continuing to use the journal, even at this phase, will better ensure your success in reaching your goals. You will find it an ongoing resource, referring to and adding to the information you logged long after you finished The Workbook.